Considering Jet Management? Ask us about our Signing & Retention Bonuses! 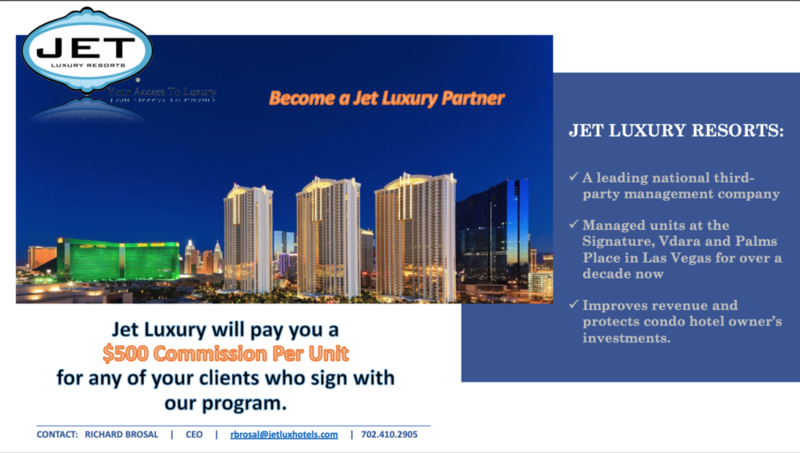 Jet Luxury Resorts is the premiere third party management company, offering inclusive management in properties such as the the Trump Waikiki, the Vdara Hotel, Palms Place and The Signature MGM Las Vegas to name a few. Jet Luxury Resorts is able to continuously fill monthly inventory for condo hotel owners who often find themselves at the bottom of the list when it comes to the hotel. Jet Luxury is the ONLY approved third party for the Trump SoHo, Palms place, Trump Waikiki and Vdara Hotel & Spa. Jet Luxury Resorts dedicates 100% of our resources toward the protection, upkeep, and revenue of your investment. Ask us about our substantial signing & retention bonuses for new owners. Jet Luxury Resorts is a 4 & 5 star Hotel and Resort Management Company that represents designated rooms within a collection of brand name luxury hotels as well as exclusive estates worldwide. Through honest service to owners and access to exclusive inventory, Jet Luxury Resorts is able to offer fill high-end hotel inventory at lower prices. This creates a Win-Win -- the condo hotel owner wins with high margins & occupancy while the hotel guest wins by receiving a discounted rate compared to the market.